The Apaches probably migrated from western Canada sometime around 850 AD. Largely they were hunters and gathers who ate deer, rabbits, and wild plants. The Apache especially enjoyed a cactus called mescal and mesquite seeds. Cactus and mesquite played a major role in their diet. When they didn't have enough food they raided other tribes for food. The name Apache was given to them by the Zuni Indians. In Zuni it means “enemy.” They roamed all over the Southwest, northern Mexico, Oklahoma, Texas, and Kansas. The Apache lived in dome shaped buildings called wikiups. A wikiup consisted of a pole framework covered with brush, grass, and reeds. Usually, there was a fire pit in the middle and a smoke hole in the ceiling. The Apaches wore deerskin clothing, but were also known to trade for cotton and wool textiles. The Apache made very detailed baskets that came in many elaborate shapes and sizes. They were very religious and considered the god Ussen, the “Giver of Life” to be the most powerful of supernatural beings. The Mountain Spirits or Gans were also very important and the focus of many religious tribal ceremonies. Shamans presided over all religious ceremonies. The first Apache contacts with white settlers were not hostile. Francisco de Coronado first encountered the Apaches in 1540. He called them the Querechos. In the 1600's the Spaniards constructed a group of forts across northern Mexico in an attempt to stop Apache attacks. This did little to slow the Apache raiding. At the same time all attempts to convert the Indians to Christianity failed. Then, after the Treaty of Hildalgo was signed in 1848 the United States took control of the Apache territories. Before long, the white settler population increased dramatically. At the same time, the raids continued because the Apaches believed that these people were trespassing. 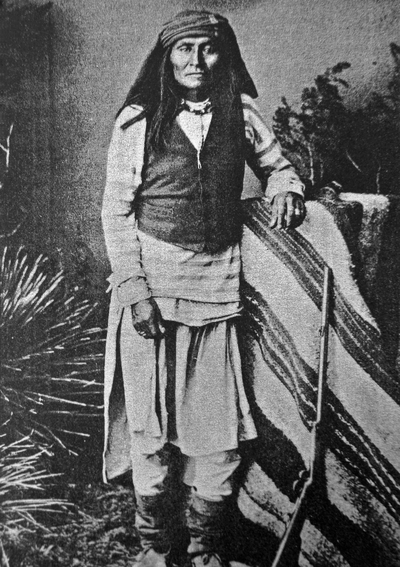 In the 1860's hostilities escalated when the U.S. Army accused the Chiricahua Apaches and their leader Cochise of kidnapping children and stealing cattle. The army retaliated by taking several Apaches hostage. The Apaches wasted no time getting even. They were now attacking white settlers and wagon trains at every opportunity. Before long, Cochise was joined by his father-in-law Mangas Colorado and the Mimbreno Apaches. For a short time the U.S Army managed to drive Apaches into northern Mexico, but that all ended when the Civil War broke out and many of the soldiers left for the battlegrounds. Eventually, Cochise signed a peace treaty. In 1871, settlers from Tuscon attacked Camp Grant and killed more than 100 Aravaipa Apaches, mostly women and children. This convinced President Ulysses S. Grant that the whites and Apaches should be separated by using a reservation system. The last major battle between the Apaches and the U.S. Army occurred after soldiers from Fort Apache attempted to arrest a medicine man named Nakaidoklini. Nakaidoklini preached a version of the Ghost Dance religion, which had become so popular that the government moved to outlaw it. The religion claimed that dead warriors would be resurrected and drive out the whites. Instead, he died in the battle that ensued. Soon afterward, the Chiracahua were joined by the other Apache bands as they fled the San Carlos Reservation. The Apache Chief Geronimo and his men put a a fierce resistance against General Miles and 5,000 troops before surrendering. Geronimo was still a prisoner when he died in 1909.